My good buddy Park Howell, who teaches at Arizona State University’s School of Sustainability with its new Executive Master’s for Sustainability Leadership program, sent me this very cool revelation yesterday. See for yourself. 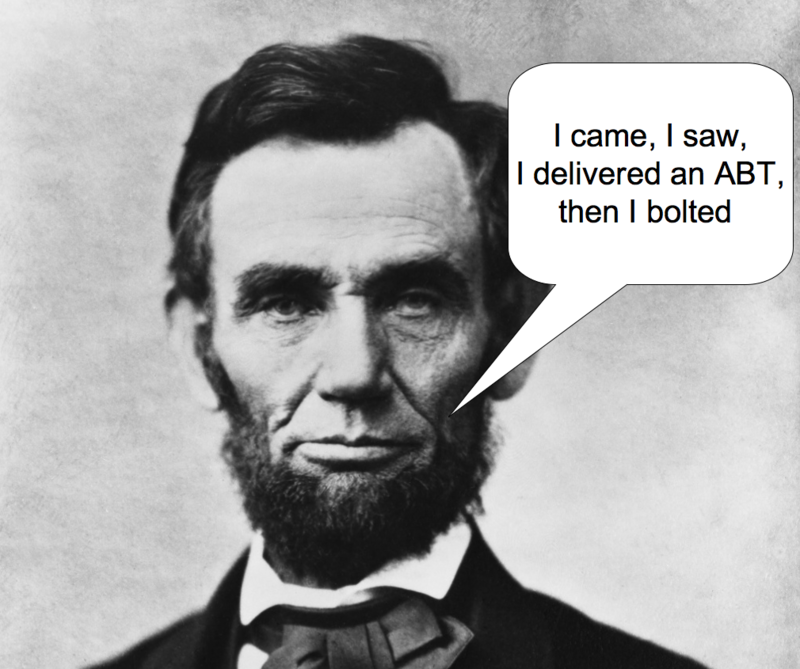 Did Lincoln have good narrative instinct or what. He knew that almost 100,000 casualties in three days deserved something better than a droning “and, and, and” presentation. Pretty amazing. And if you’re wondering about the range of application of the ABT (And, But, Therefore) as a narrative tool, just look at this anecdote a friend sent about her 7.5 yr old son. Yes, it is indeed a universal narrative template. I am now averaging about one ABT revelation email a day as people are telling me about using the ABT for structuring their presentations or getting their students to summarize their projects with it. Park Howell earned my undying respect last September as an early adopter of our book and app. He was one of the first to “get it” on the ABT. He wrote this great blog review, relating our materials to his awesome Zombie MBA presentation he gives to business school students at Arizona State University. Now he has spotted something simple and profound. Turns out a little piece of American history called the Gettysburg Address matches the ABT structure to a tee. He has added the BUT, and replaced a later “but” with THEREFORE. Otherwise, it is what is known as the Bliss version of the address, which is the version most widely accepted (you can read about it here). Four score and seven years ago our fathers brought forth on this continent a new nation, conceived in liberty, and dedicated to the proposition that all men are created equal. But now we are engaged in a great civil war, testing whether that nation, or any nation so conceived and so dedicated, can long endure. We are met on a great battlefield of that war. We have come to dedicate a portion of that field, as a final resting place for those who here gave their lives that that nation might live. It is altogether fitting and proper that we should do this. Such concision. And even in an age of long attention spans. I thought you might get a kick out of this…. We got a Wii U for the family for Christmas and my 7.5 year old son would spend all day playing it if he could. He can play for 30 minutes a day, but the hitch is that he has to write a paragraph afterwards about what he did in the game. This has turned into an excellent teaching opportunity. Today’s paragraph featured a string of “and’s” – he unlocked this, he flew that, blah blah blah. First I had him use the dictionary to correct his spelling errors and then we sat down with his notebook and my computer to rewrite his paragraph. I told him your line that “a story begins when something happens.” I asked him where his story started, he looked at his notebook, and he pointed to the sentence: “My game was fun, but I couldn’t get into the fire chief’s office.” A-ha!! His story didn’t start until nearly the end of the paragraph, so I asked him about his first sentences. “Well that’s just a bunch of and’s!”. So we talked about how “and’s” are boring and if he writes a paragraph of and, and, and…my eyes glaze over and there’s nothing I can ask him about his game (he so desperately wants me to be interested in this game). But when he wrote that it was hard getting into the fire chief’s office, I had all sorts of questions: Why was it hard? Why did you need in there? I told him about “And, But, Therefore” and I swear the light bulb went off – I wish you could have seen his face! So we sat at the computer and rewrote his paragraph. He’s playing again (he owed me a paragraph from yesterday) and I’m going to have him write another paragraph afterwards. I’ll be curious to see if the ABT sticks. It was amazing though how quickly he got it. He didn’t question that his sentence “I flew a helicopter” was boring. I said, well why did you write about it then? “Well, it was a hospital helicopter and it was the first time in the game I got to fly a helicopter.” OK, well, why don’t you include that in your paragraph? It is no wonder there are so many horrid writers out there. The way the school teaches them to write – the five sentence paragraph – is very boring. Overview sentence, three supporting details, summary sentence. It doesn’t encourage the kind of narrative structure that is so important. Sort of like the format of a scientific paper – the narrative structure can be incorporated but no one points it out to people learning to write….